These days, there are a lot of filmmakers who love using DSLR cameras for their films/videos. DSLRs have become very popular choices for many aspiring filmmakers and even professionals in the field. An external monitor is an essential tool for filmmakers as it can help you frame the shots perfectly in a more convenient way. It’ll help you produce higher quality films/videos in the long run. With so many options out in the market today, we’re here to help you find the right external monitor for you and your DSLR camera. Here are the top 5 best external DSLR monitors you can choose from. To be clear, while these are great monitors for DSLRs, keep in mind that they will also work perfectly well with any mirrorless or compact camera that has the proper connection ports. 1.1 What Do All These Technical Stats Mean? 1.2 Why Purchase An External DSLR Monitor? What Do All These Technical Stats Mean? Before we get into the reviews, here is a quick reference if you’re not sure what any of those acronyms or technical terms refer to. The resolution is a measurement of how many pixels there are vertically and diagonally. PPI (Pixels Per Inch) is a measurement of the pixel density. A higher density makes for a less pixelated image. You may not have known this, but a 1080p resolution on a 5″ screen is actually more pixel dense than a 1080p display on a 7″ screen. This is why it is important to judge your screens by PPI rather than resolution. Nits are a representation of how bright the screen gets. Basically, the higher, the better. Brightness is very important when using your monitor outside in the sunlight. Lower nits may be hard to see during the day, so if you work outside a lot, you’ll want those nits to be as high as possible. It is important to note however that using higher brightnesses on your screen will drain your battery faster. Obviously. The difference between the blackest blacks and the whitest whites. Once again, the larger the ratio, the better. 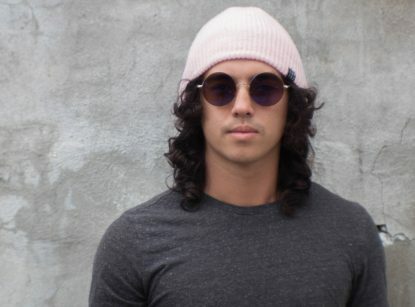 Your image will be more crisp and a more accurate representation of what your camera is actually capturing. Having an IPS display is absolutely necessary for anyone in video production, or other fields where screen sharing is required. In Plane Switching is a LCD screen technology that allow screens to be clear and bright from more angles, essential if there is multiple people monitoring footage. IPS displays also have much greater color accuracy, which is critical to making sure your shots are white balanced and exposed properly, especially when you’re setting up new lights. Why Purchase An External DSLR Monitor? An external monitor is one of the best purchases you can make for your DSLR. Here’s a few reasons why. On-camera monitors are far too small to actually be able to make sure things are in frame and in focus. They allow more than one person to see what’s going on. You can set them up far away from your camera to keep the set clear. Most monitors have ultra bright screens for visibility outdoors when you need it. They can include additional features to ensure your shot is properly colored, exposed, and in focus. 4k HDMI and 3g-SDI ports. 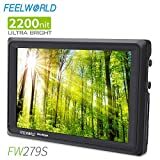 The FW279S 7 inch Ultra Bright model from FEELWORLD is our overall best pick for external DSLR monitors. It’s great for both indoor and outdoor use with a nice 7-inch monitor that will help you frame your shots perfectly. While not the lightest monitor on our list, the FW279S is incredibly bright and is by far the best choice if you’re shooting in the hot sun. This external monitor has a 1920×1200 resolution with professional color calibration to help provide a sharper image. This is ideal for focus pulling from an HD or 4k signal and image analysis while you’re on set or in the field. The FW279S monitor 2200 cd/m2 bright backlight screen is perfect for outdoor usage, allowing you (and everyone else on set) to be able to monitor the footage without worrying about glare. This monitor supports ITU standards and HD video recordings with an advanced image processing technology that reproduces colors accurately, ensuring that colors are natural. The FW279S comes with features that help make sure your shot is in focus and has accurate exposure. Histogram, Peaking Focus Assist, False Colors, Zebra Exposure, Nine Grid, Scan Mode, Zoom, Anamorphic Mode, Pixel to Pixel, Center Marker, Safe Area, Ratio marker, Marker Color, Check Field, Image Flip, Image Freeze, Zoom All, U/D & L/R Zoom, Color Temperature Adjustment. The menu controls for this monitor are intuitive and easy to use. You’ll get the full button layout with two different feature buttons that are programmable to the various features that you often use. The monitor cam automatically saves parameters that you have previously set, keeping the original settings for the next time you turn it on. You won’t have to constantly reset the monitor, keeping things more convenient and simple. Overall, it’s an excellent external DSLR monitor that any filmmaker will love. The A7S 7-inch monitor from Lilliput is another excellent choice for anyone looking for an option that’s a bit cheaper than the ultrabright Feelworld. If you aren’t going to be shooting in direct sunlight as much, the lower 500 Nits brightness should perform adequately. The contrast ratio is on the lower end at 1000:1, but is definitely good enough to give you an accurate representation of the image. This monitor’s 7-inch screen has a very high resolution of 1920×1200, with an impressive ppi of 324. It’s compact, lightweight and durable, great to bring out into the field, and has even better viewing angles than our previous option! The A7S also has some nice features that are very helpful, including a Histogram, Peaking, Zoom, False Color, Grid, Aspect Ratio, Audio Meters, Safety Markers, Image Flip options, and Color Temperature. You can also program customizable keys that allow you to make shortcuts in the monitor’s functions, saving you a lot of time. This monitor also comes with a nice silicon rubber case for extra protection and a sunshade to help with outdoor filming situations. The screen itself is a little glossy and that can cause some glaring problems, however, the sunshade should help. The battery life will last you around 4 hours, a good amount when compared to other monitors within this price range. Just keep in mind that you’re going to have to buy batteries separately as they don’t come with the monitor. 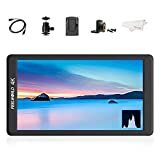 This is a great video assist monitor that comes with helpful features, all at a very affordable price when compared to other monitors that do similar things. 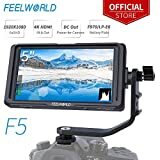 The F570 from Feelworld is a great monitor, especially if you plan to use gimbles and other stabilizers with your DSLR camera. This 5.7-inch monitor has a nice high resolution, full HD screen with a resolution of 1920×1080, with a great ppi of 386. It supports 4k HDMI inputs and outputs. It has an ultra-thin design (18.6mm in thickness) that is simple, compact, and rugged for your stabilizer. You can accurately expose and focus every shot with this monitor’s powerful focus and exposure tools. This monitor also has false color tools that work by highlighting specific color ranges of luminance with a solid color overlay, helping you keep exposure consistent for every shot. This monitor has stand 1/4″ mount points that allow you to attach this monitor to your cameras and rigs. You can also set this monitor on a table using its built-in kickstand. With its smaller size, this monitor is easier to travel with while still providing you high-quality sharp images, making it an excellent HD viewfinder. You also get a sunshade designed by Feelworld that is easy to install. This gives you more flexibility, helping you film in outdoor situations. There’s a 12V DC input on the side and space for a battery plate on the back. You can connect to the 12V DC input and get continuous power. There’s also the option of running it off of a compatible rechargeable battery. Overall, the F570 is an excellent monitor, especially if you plan to use gimbles and stabilizers along with your DSLR camera. The F100 external monitor from Neewer is a very good choice for someone who’s shopping with a lower budget. This monitor has a 7-inch screen with Ultra HD 1280×800 resolution, supporting 4k input. You’ll also be able to use a mini HDMI cable, making it compatible with cameras that have Mini HDMI interfaces. It’s well-designed and has a wide view angle IPS panel with an LED backlight. The panel may not have as high of a pixel density as the other options, but it makes up for it by being more than bright enough, and the contrast ratio is even better than the much more expensive Feelworld F570. If you want the best product while spending the least money possible, this seems like the obvious choice out of all the products we looked at. With its 360-degree adjustable hot shoe, you’ll be able to change the angle smoothly while shooting. This monitor also comes with a sun hood that can help keep the light, making it more applicable for different environments. The F100 monitor also works great when attached to steady cams, camcorder kits, and stabilizer rigs. Weighs less than half of any of the other options. The last external DSLR monitor we would like to talk about is the F5 from Feelworld. It’s going to be the smallest monitor on the list for people who are looking for a smaller display. This monitor has a nice 5-inch display supporting full HD at a resolution of 1920×1080. By cramming that many pixels into such a small screen, it has by far the highest PPI out of all the monitors, at a staggering 440. This increased detail more than makes up from the lackluster 1000:1 contrast ratio in our book. It also features HDMI inputs and outputs that support 4kUltraHD without delay. Our favorite thing by far about this monitor however, is just how lightweight it is. While all of the other options weigh around 270-360 grams, the Feelworld F5 only weighs 143 grams. This means that no matter how hefty your camera rig is, you can likely slap this on without worrying if it will make it too heavy. The F5 uses color calibration technology that helps it calibrate efficiently and get accurate color reproduction. It will not distort the color, always showing the real image with accurate colors when you are shooting video. There’s also a Peaking Filter that is used to aid the camera operator in obtaining the sharpest possible picture during filming. The monitor includes a cold shoe mounted tilt arm that can tilt 360 degrees, giving you a wider angle of view. Overall, you will find that this monitor has similar features that are found on the FW279S, the option we were talking about earlier in this article, just with the brightness and size sacrificed for a higher pixel density and more portable size. Histogram, Peaking Focus Assist, False Colors, Zebra Exposure, Nine Grid, Scan Mode, Zoom, Anamorphic Mode, Pixel to Pixel, Center Marker, Safe Area, Ratio marker, Marker Color, Check Field, Image Flip, Image Freeze, Zoom All, U/D & L/R Zoom. The F5 5-inch monitor is an excellent choice, especially for people who are looking for something with a smaller display. Well there you have it, the 5 best external DSLR monitors that we think are the best on the market. 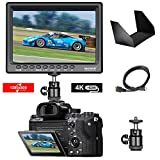 Each monitor we have discussed can easily improve your overall filmmaking quality and experience, no matter which option you decide to go for. 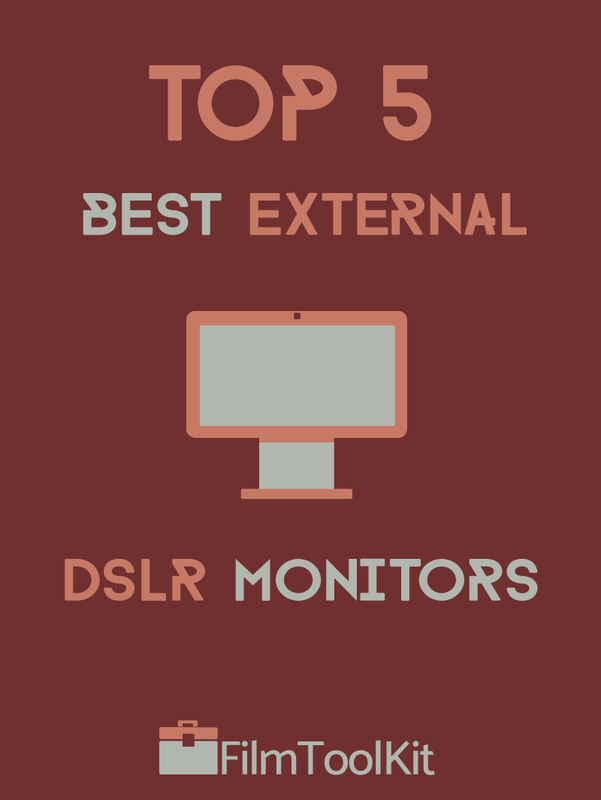 Hopefully this list has helped you figure what kind of external monitor would be best for you.